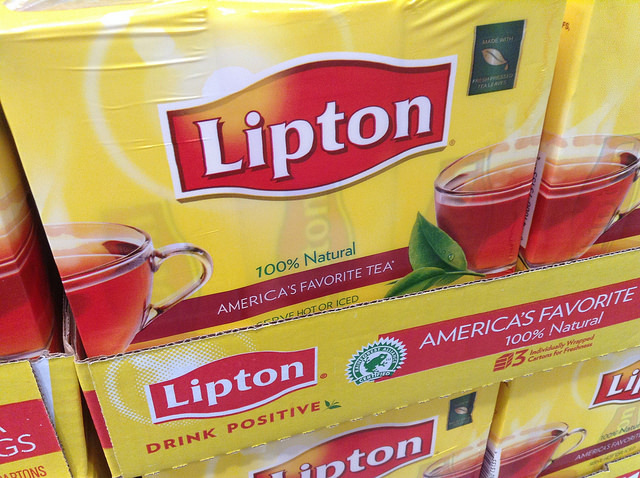 Lipton is the highest selling tea in the world, with distribution in 110 countries in 2015. Thomas Lipton (1846 – 1931) was a Glaswegian grocer. Lipton believed that if he could lower the price of tea he could increase sales among the working classes. He removed the middleman by acquiring thousands of acres of cut-price tea plantations in the south of Ceylon (now Sri Lanka) in 1890. Lipton passed the savings on to the customer. Lipton claimed to have the largest sale of any tea in the world “beyond doubt” by 1897, and millions drank his tea every day. Over one million packets of Lipton tea were sold in Britain every week. 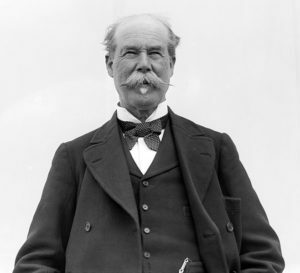 Thomas Lipton paid a record-breaking £35,000 duty on a week’s purchase of tea in 1897. This was over half the average for the total weekly tea market, which Lipton now claimed to dominate. By this time his tea enjoyed a Royal Warrant from Queen Victoria (1819 – 1901). Several thousand workers were employed on his Ceylon plantations. By at least 1899, Lipton tea was blended differently for different regions, in order to suit the local water. Lipton had received a Royal Warrant from Edward VII (1841 – 1910) by 1907. 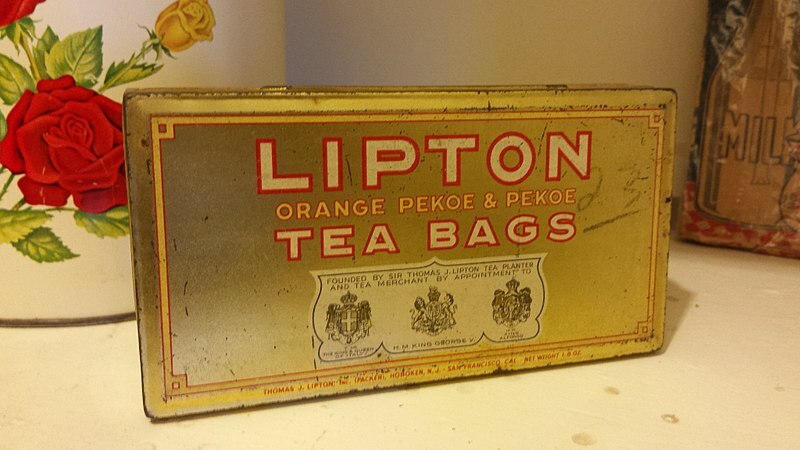 Lipton tea could boast thousands of outlets in Britain by 1918. By this time the Lipton company had been awarded the Royal Warrant as tea merchants to George V (1865 – 1936). Lipton could refer to the yellow packaging of his tea as famous by 1924. The company claimed to be the largest tea distributors, manufacturers and retailers of food products in the world. However the company had entered into difficulty by 1926. The business had outgrown the overworked Thomas Lipton, but he refused to take advice from his board of directors. He was forced to resign from the company he had built in 1927, and his stake was acquired for £60,000. 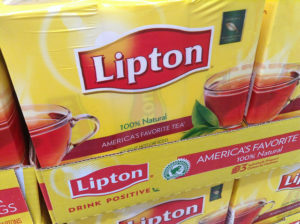 Lipton was acquired by Home & Colonial, a large grocery chain, in 1931. Thomas Lipton died in 1931. He left a British estate valued at over £1.4 million. He left an American estate valued at £757,000. Lipton divested some of its plantations in Ceylon in 1944, but retained 3,400 acres of high quality tea estates. Supermarket chains grew from the 1950s. These chains were reluctant to stock the product of a rival grocer. Lipton tea sales in Britain declined and never recovered, and the company concentrated on its significant tea sales overseas. Lipton had total coverage of the Indian market by 1968. The company built a new fully automated factory of over 175,000 sq ft. It was one of the world’s largest tea packing and blending factories. By 1969 Lipton tea was sold in 156 countries, and 29 factories packed Lipton tea. The Lipton tea interests were acquired by Unilever, the Anglo-Dutch consumer goods giant, for £18.5 million in 1972. By this time Lipton was a relatively small player in the British tea market, and was outsold by two Brooke Bond brands (PG Tips and Dividend), as well as Tetley, J Lyons, Typhoo and the Co-operative Wholesale Society. Lipton enjoyed great success in the United States, with 50 percent of the market by 1975. All Lipton tea was packed and blended at a factory in Leighton Buzzard, Bedfordshire, by 1979. It was the largest tagged teabag factory in Europe. Lipton was awarded the Queen’s Award For Export that year. Lipton Yellow Label was the highest selling tea in the world, a blend of Ceylon, India and other tea leaves. 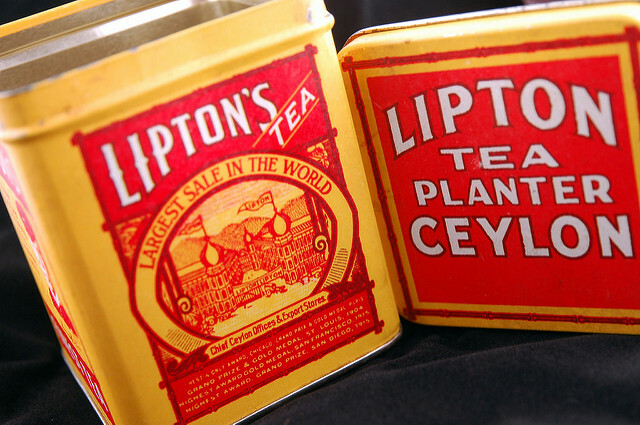 Lipton exported more tea to more countries (over 120) than any other company by 1980. Lipton tea market share in Britain was “minuscule” by 1983. The Leighton Buzzard factory was closed in the late 1990s, and production was relocated to a site in Dubai. The Dubai site is now the largest tea factory in the world. Lipton Yellow Label has a very small presence in Britain, and is better known for ice tea soft drinks.